Rough seas preceded an outgoing tide leaving a sand cliff about 5 feet high. We played on these cliffs as children as the soft sand provided for an easy fall. The island is ever changing; sometimes the cliffs are there, sometimes they are not, sometimes they are high and other times very small. Always they are pure white, unless they are in shadow or reflecting the light of the sky. The sand is a fragile fortress though. It cannot withstand the harm caused by oil. The black will penetrate and permeate and change it forever. 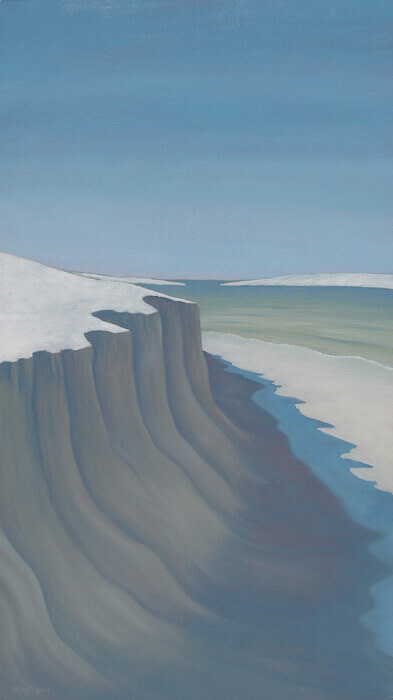 I painted this piece at a scale such that when hung, the illusion of the actual size of the cliff (shoulder height), the width of the dampened sand and the sharp curvature of the shoreline, would be realistic. It pulls the viewer around the Island’s tip where the Bay meets the Gulf.